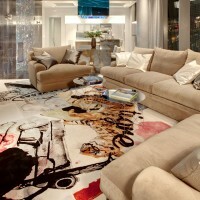 American interior designer Mark Tracy of Chemical Spaces has completed a penthouse residence in Las Vegas, Nevada. 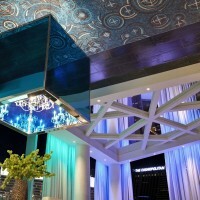 Mark Tracy started the design of this project with the intent to use the finest materials on every surface to create a friendly, inviting, colorful, and extravagant design for a penthouse unit in the Veer tower of Las Vegas’ modern City Center development. 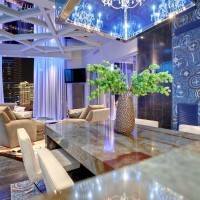 This penthouse‘s primary features include a 13’ tall by 13’ wide floor-wall-ceiling glass mosaic in an ocean blue color scheme with embedded images and bordered by a glass veneer tile. 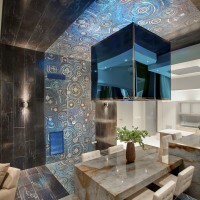 In the middle of the centerpiece mosaic hangs a chandelier encased in a blue glass cube. A “Blue Louise” granite table floats off the kitchen island acting first as a bar elevation and then seamlessly dropping to a lower elevation where it serves as the units primary dining area. The master bedroom shows off a 13’ tall c-shaped bed of Italian porcelain tile complete with its own chandelier. Beside the bed hangs a custom chain curtain featuring Shepard Fairey’s signature tag which divides the bedroom from the master bath. The living and main party area is crowned with a one-of-a-kind mirrored ceiling made of triangular shaped mirrors each separated by ceiling beams reflecting the lighting effects of the unit and the neon shining through the windows from the Las Vegas strip outside. The space also features a custom rug by HZL Henzel atop metallic white hardwood floors. Design began from drawing before completion of the tower in February 2009. Construction began in June of 2010 and was completed in March 2011.